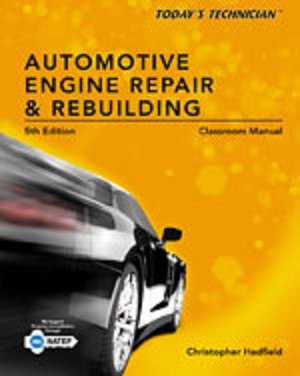 Today's Technician: Automotive Engine Repair & Rebuilding 5th Edition, Newest Edition from Cengage/Delmar learning! TODAY'S TECHNICIAN: AUTOMOTIVE ENGINE REPAIR & REBUILDING, 5th Edition delivers the theoretical and practical knowledge you need to repair and service modern automotive engines and prepare for the Automotive Service Excellence (ASE) certification exam. Designed around National Automotive Technicians Education Foundation (NATEF) standards, this system-specific text addresses engine construction, engine operation, intake and exhaust systems, and engine repair, as well as the basics in engine rebuilding. Move your career forward with discussions about advancements in hybrid technology, factors affecting engine performance, and the designs and functions of modern component parts. Long known for its technical accuracy and concise writing style, TODAY'S TECHNICIAN: AUTOMOTIVE ENGINE REPAIR & REBUILDING, 5th Edition revs up your reading experience with realistic line drawings, detailed photos, critical thinking questions, and much more! Two Volume Set: One manual is a study guide designed to help you pass the ASE Automotive Engine Test. The second manual is designed to be used in the shop or repair facility as a reference guide when doing repairs. Provides readers with the technical information they need to repair and rebuild modern, electronically controlled and hybrid automotive engines. Contains expanded engine rebuild details including a detailed description of overhead valve systems with variable control. Features state-of-the-art information on the global automotive industry and the role of the technician within it.